This book shows a remarkable application of the 'Vertically and Crosswise' sutra in finding powers and roots of numbers and polynomial expressions, and also solving polynomial equations. This book is in my opinion, a masterpiece and it pushed me into wanting to create a pathway for my students to reach this level of mathematical insight. I really liked the layout of the book: introductory concepts (duplex, triplex, etc.) first, then later concepts. I liked that you had exercises and answers. The "light bulbs" in the margins were helpful. The book delivers what it promises: one Vedic "master formula". The Urdhva-Tiryak sutra really illustrates the "unified" nature of Vedic Math, as it applies to roots as well as powers. This is a valuable supplement to Bharati Krsna's text, and hopefully will help legitimize Vedic Math in the West. I think your recent book "Crowning Gem" is masterpiece and invaluable gift to student. Mathematics is soul of almost all science. So mathematics should be closer to brain in order to leverage sciences in next generation. Book has achieved this goal partially by turning mathematics into interesting art. I Have done this course. This is mind blowing. We are lucky to have this chance. Everybody should do this course. Thanks Williams Sir. - Kuldeep Singh, Vedic Maths Trainer, New Delhi, India. Your book was a delight and I've now passed it on to another mathematically inclined friend here. It was very stimulating and a real breakthrough. Besides the elegance of the method itself, I liked how you built up the fundamentals in section one, which I referred back to when moving on to subsequent sections. The book was so clear and simply expressed with no excess words. When Bharati Krsna Tirthaji (1884 – 1960) reconstructed the ancient system of Vedic Mathematics he left us with one book on the subject, “Vedic Mathematics” 1 (and a great many questions). In his book he describes a division technique which he called the “Crowning Gem” of Vedic Mathematics, the essential feature being that the first digit of the divisor is used to provide all subsequent digits when combined appropriately with the other digits involved. He then goes on to find square and cube roots in which the first digit of the answer is used in a similar way. This book explores the consequences of such an approach, which leads to a single formula that is best understood as a pattern. With this pattern you can find powers of numbers, and in reverse, find roots of numbers and solutions to polynomial equations. This is a completely general method: simple yet surprisingly powerful and far-ranging. The basic formula/pattern, once assimilated, allows solutions to be found with great ease. The simplicity of this is such that it has been possible to make this book self-contained, so that only a basic background knowledge of mathematics is required. Bharati Krsna wrote 16 volumes on Vedic Mathematics, but these were lost and we have only his introductory book, written in 1958 and published in 1965. The book presents mathematics in a way that is unified, and a lot of work needs to be done to fill in the many gaps so that a complete picture of the subject can be understood and appreciated by all. The main features of the modern approach to mathematics are fragmentation and a strong emphasis on intellectual understanding. Fragmentation, because maths is seen as more and more topics ad infinitum, whereas the coherence and unity that is naturally there in the subject is hardly considered at all, even though that is what most children are in need of. The emphasis on intellectual understanding works well for those who can cope and enjoy such an approach, but that leaves out the majority. Mathematics is naturally a creative and highly flexible subject, even artistic. It is clear from a careful reading of Bharati Krsna’s book that Vedic Mathematics offers a better approach to mathematics and mathematics education, that does not suffer from the above mentioned drawbacks. The book is in four sections of three chapters each. - sets things up (for the formula given in Chapter 4), by extending the idea of the Duplex to Triplexes and higher order ‘Plexes’. The reader will need to spend some time getting familiar with the Triplexes which will enable easy cubing, general cube roots and solution of cubic equations. This neatly extends further to Quadruplexes and so on, enabling higher powers, roots and polynomial equations to be tackled with the same formula/pattern. - gives the formula and shows its application in finding powers of numbers and polynomial expressions. - reverses this pattern to find roots of numbers and polynomials, and strangely enough this is easier than finding powers. - extends this very naturally to go on from the roots of the previous section to the solution of polynomial equations. If you wish you can take an easier path through the book by avoiding powers over 3 to start with. In that case you may omit Chapters 6, 8 and 9, and parts of other chapters that involve 4th and higher powers. As an illustration of the efficacy of the pattern, below is an example taken from Chapter 11 in which a solution to the cubic equation x3 – 4x2 + 12x = 32 is found to 5 figures. The subscripts on the first line are remainders, the 15 on the left is a constant divisor, and the 5 and 1 on that line are ‘multipliers’ which are particular to that equation and easily found. The answer on the bottom line flows easily, digit by digit, using the Vertically and Crosswise formula. The calculations can be extended to any number of figures, and digits over 5 can be avoided by use of the vinculum device. The subject of this book has been under study since I first started researching Vedic Mathematics. Several times I have tried to extend the ideas Bharati Krsna gives us, with some success. Early in 2013 I was asked how to cube a quadratic in Vedic Maths. After some thought I gave an answer in which each term could be generated from the previous term, and pointed out that that method was reversible. Subsequent work opened the topic up so that I could show how to find powers, roots and solve polynomial equations. I began to write the work up, as that clarifies the subject and shows up gaps that need to be dealt with. But the remarkable thing was that during this unifying work the whole construction simplified itself, not once but several times. The final result was an amazing combination of simplicity and potency that presented itself as a pattern. I hope I have been able to adequately convey the simplicity, potency, compactness and beauty of the formula shown here. A beautiful and powerful Vedic formula is revealed here for the first time – a simple pattern, which is an expression of the Vedic formula “Vertically and Crosswise”, is applied to find powers and roots of numbers and solution to polynomial equations. This single, far-reaching method is general and enables easy and quick solutions to such problems. The secret of this is simply the technique given by Sri Bharati Krsna Tirthaji as the “Crowning Gem of Vedic Mathematics”, in which the first digit of the required number is used to obtain the other digits. The reader is taken through short easy steps, and the method is so easy that only an elementary knowledge of mathematics is required to absorb and apply the pattern. 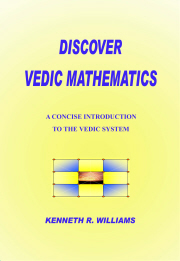 Kenneth Williams has been teaching and researching Vedic Mathematics for over 40 years. He has been invited to give courses in many countries around the world and is the author of several books and DVDs.